Algeria is the largest country in Africa, with an economy dominated by petroleum products, a sizeable military, and considerable regional influence. Agriculture, supported by irrigation, makes up a small part of the economy. Most people live on the north, Mediterranean, coast. The Saharan desert, which covers the south of the country, is sparsely populated. Over 80% of both the rural and urban population are classed as having access to safe drinking water. Water supply is heavily dependent on groundwater, for drinking, agriculture and industry. Agriculture in the north of Algeria relies on groundwater irrigation, from relatively young and shallow coastal aquifers, which are actively recharged by rainfall. In the south, deep sedimentary aquifers contain vast quantities of ‘fossil’ groundwater, which is not being actively recharged. Groundwater from these deep aquifers has been used traditionally for centuries, at relatively small scale, through foggaras – water galleries, and there are also larger modern abstractions. Groundwater level decline in some areas shows that some over-exploitation is taking place. Groundwater abstraction is promoted by subsidies, which make it relatively cheap to use, and discourage water conservation. However, water subsidies are underpinned by revenue from oil and gas, and are threatened by falling world hydrocarbon prices. To protect its hydrocarbon revenues, the Algerian government has proposed developing its large shale gas resources, using hydraulic fracturing, which has met with concern relating to potential groundwater pollution, particularly related to ‘fossil’ groundwater, which is irreplaceable. Aquifer pollution has occurred in some areas, for example saline intrusion along the coast relating to over-abstraction, and nitrate pollution from agriculture, despite legislation to limit nitrate contamination pollution from agricultural activities. Please cite this page as: Chabour, Mebrouk, Hassani, Upton, Ó Dochartaigh and Bellwood-Howard, 2018. The northern coastal area of Algeria is hilly, sometimes mountainous, with a fertile plain between the coast and the 1 500 km-long Tell and Saharan Atlas mountain chains that run parallel to the coast. To the south of the Atlas mountains is the larger part of Algeria's land surface, which is dominated by the Sahara Desert. The climate of Algeria's northern coastal region is temperate, with dry, hot summers and mild, wet winters. Average annual precipitation in the coastal region is around 600 mm, ranging up to 1800 mm in the east. The climate in the south of Algeria is arid, with average annual rainfall less than 100 mm, and sometimes close to zero. Rainfall in this area is usually concentrated in rare, short events. 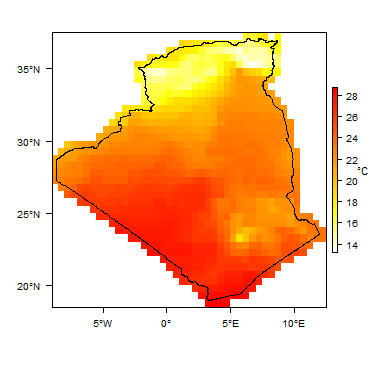 Average temperatures generally increase from north to south, although values are slightly higher in the coastal region compared to the Atlas mountains, because of the cooling effect of elevation. There are temporal changes in precipitation and temperature throughout the year. The hottest months of June, July and August generally correspond to a distinct dry season. 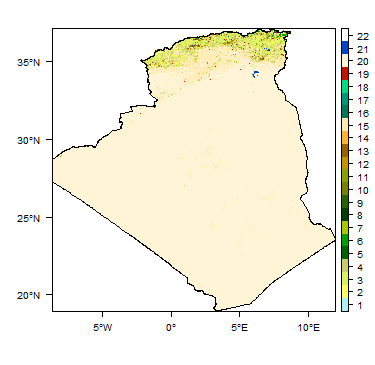 More information on average rainfall and temperature for each of the climate zones in Algeria can be seen on the Algeria climate page. There are 17 major watersheds in Algeria. Low rainfall means that the majority of rivers in the mountainous and desert regions of Algeria are ephemeral, flowing only after large rainfall events. Only the rivers in the northern coastal region are perennial, flowing all year round. In the south, wadis (ephemeral rivers) drain to closed internal sinks - chotts or sebhkas - which are subject to high evaporation rates. The Chelif (or Cheliff) River is the longest river in Algeria, flowing for 700 km from its source in the Saharan Atlas to its discharge point in the Mediterranean Sea. In some watersheds at large dams, hydrometric measurements are made by the National Agency of Dams and Transfers (ANBT). Soils in the mountainous Atlas region of Algeria are dominated by stony leptosols. In the drier area to the north of the Atlas, soils are generally rich in calcium carbonate (calcisols). Many of these soils are suitable for agriculture, but water availability is a key constraint on crop growth. Along the wetter coastal region, soils are better developed and give rise to more vegetation - these include luvisols and cambisols. Vertisols, which support extensive cereal cultivation and grazing, occur in the eastern coastal region of Algeria. The arid region to the south of the Atlas is characterised by poorly developed leptosols, which contain little organic matter. Regions of arenosols denote large areas of sand dunes. Fluvisols are found along river valleys. To the south of the Atlas the rivers are generally ephemeral, but in the wetter northern region, where rivers are more or less perennial, the valleys are often intensively cultivated. This section provides a summary of the geology of Algeria. More detail can be found in the references listed at the bottom of this page. Many of these references can be accessed through the Africa Groundwater Literature Archive. The geology map on this page shows a simplified overview of the geology at a national scale (see the Geology resources section for more details). Other, larger scale, geological maps are available: for more details see the Key geology references section below. - the Southern (Saharan) domain, which is relatively stable and where the impact of tectonics is less pronounced. - in the northern part, the Tell Atlas, a complex area composed of tectonic layers stacked up during the Miocene. Late Neogene sedimentary basins, such as the Chelif Hodna, formed on these Miocene tectonic sheets. The southern (Saharan) domain lies to the south of the Atlas mountains and belongs to the North African Craton. Precambrian basement is unconformably overlain in much of this domain by thick sedimentary rock of Palaeozoic to Mesozoic age, which have formed in several basins separated by high ground. Recent-Quaternary These unconsolidated sediments include sabkha and lake deposits; fluvial and recent alluvial deposits, often deposited in intramontane grabens; and dune deposits. Intramontane alluvial deposits are typically highly heterogenous: for example, sometimes almost isolated gravel lenses within a dominantly silt sequence. Many alluvial sediments were deposited in intramontane grabens, overlying generally carbonate bedrock. Volcanic Plio-Quaternary (occasionally Cretaceous) Rocks formed by recent volcanism: in the north-west (Ain Témouchent) and north-east (Béjaia and Jijel). Cretaceous Mainly marine sedimentary rocks. - detrital and silicious rocks that crop out in the Atlas mountains. - the Continental Intercalaire, of Early Cretaceous age: largely terrestrial siliciclastic clayey sandstones with some marine Aptian limestones and clay formations. Reaches up to 2000 m thick (Castany, 1981) and occurs at depths ranging from around 400 to 2000 m below ground (Schmidt, 2008). Occur in elongate basins in the Atlas domain, and very large basins in the Sahara domain; e.g. the dorsale du M'Zab in the central Sahara, and Monts d'Ougarta, Daoura Basin, Tademait Plateau and Tinhert Plateau in north-occidental Sahara. The Continental Intercalaire covers a total area (not only in Algeria) of approximately 600,000 km². Triassic (sometimes Permo-Triassic) to Jurassic Triassic and Jurassic rocks are not widespread in Algeria; they occur mainly in the Atlas domain. The oldest Triassic rocks are 'Karoo'-type red sandstones, limestones and claystones, e.g. in Great Kabylia. These pass upwards to evaporites and to Mushelkalk limestone. Towards the south of the Atlas domain, Triassic rocks are evaporitic and gypsiferous, underlain by Mushelkalk limestone. In the northern Atlas domain, the Jurassic sequence starts with a marine transgression and includes dolomitic limestone, passing upwards to marl in the Upper Lias. In the southern Sahara domain, the Jurassic is largely continental, with shales, mudstones, siltstones and conglomerates. Occur mainly in the Atlas domain, in a series of basins in conjunction with younger Cretaceous and Cenozoic sedimentary rocks. Cambrian (occasionally Precambrian) to Carboniferous Mainly marine, clastic and carbonate sedimentary rocks, which can reach several kilometres in thickness. Includes sandstones and dolomitic limestones. Affected by the Hercynian Orogeny. Formed in sedimentary basins separated by high ground. Proterozoic The Ougarta chain in south-west Algeria was affected by north-west to south-east and east to west folding during the Hercynian Orogeny (Donzeau, 1972). Archaean Plutonic and gneissose complex, often migmatites, in the east of Hoggar and Reguibat areas in south-east Algeria; undifferentiated metamorphic rocks elsewhere. This section provides a summary of the hydrogeology of the main aquifers in Algeria. More information is available in the references listed at the bottom of this page. 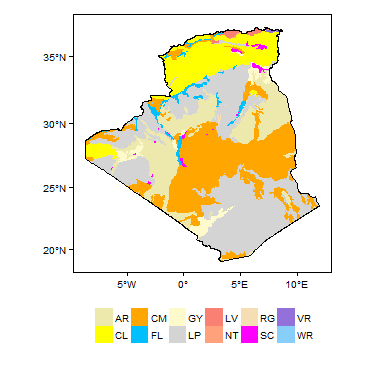 Many of these references can be accessed through the Africa Groundwater Literature Archive. Other hydrogeological maps are available, including the Carte des aquiferes de l'Algérie (ANRH, 2003) at 1:4.5 million scale; the Carte hydrogéologique de l'Afrique a l'echelle du 1:10 million (BRGM, 2008) and, for north Algeria, a hydrogeological map at 1:3 million scale and a series of maps at 1:200 000 scale (ANRH/Energoprojekt, 2009). See the Key hydrogeology references section below for more details. The complex tectonic history has segmented the main Mesozoic to Cenozoic sedimentary geological units, resulting in a large number of relatively small, spatially limited, compartmentalised aquifer units. There are three main aquifer types: (1) unconsolidated Cenozoic and Recent–Quaternary sedimentary aquifers in the coastal plain; (2) Mesozoic–Cenozoic sandstone and limestone aquifers in the mountainous areas; and (3) alluvial aquifers in river valleys. At a regional level, significant aquifers are highly fragmented. The most important aquifers are the Hodna and Chott Chergui of the Saharan Atlas, and the Mitidja and Annaba-Bouteldja coastal aquifer. This zone covers more than 80% of the country, and includes the Northern Saharan Aquifer System (SASS), comprising the lower Continental Intercalaire and the upper Complexe Terminal, which forms one of the world's largest aquifers. The groundwater in this aquifer is generally considered to be 'fossil' water (Moulla et al., 2012; OSS, 2003), and because of the very low rainfall in the Sahara (<100 mm/year), active recharge to these aquifers is extremely low. The exploitation of groundwater resources of the Sahara is therefore groundwater 'mining', with inexorable decline in available resources. Coastal plain sediments Coastal dunes are sandy deposits with highly variable thickness and lateral extent, usually ranging from 5 to 10 m thick, but up to 150 m thick, e.g. at Bouteldja. Average permeability is 10-4 to 10-8 m/s and average transmissivity is 10-2 to 10-3 m2/s. Storativity can be ~10%. The water table depth is typically 1 to 10 m.
Water quality is generally good, but the high aquifer permeability means groundwater is vulnerable to pollution, and in particular to saline intrusion. Most recharge is from direct rainfall infiltration. There is active annual recharge. Alluvium deposits Intramontane alluvial (wadi) deposits form complex, multilayered aquifer systems, characterised by strong vertical and horizontal anisotropy. Groundwater sometimes exists in almost isolated gravel lenses within dominantly low permeability silt. Average thickness of alluvial deposits at Djanet is 15 m.
Isolated gravel layers can be confined, but otherwise the aquifers are largely unconfined. Average permeability is 10-4 to 10-8 m/s and average transmissivity is 10-2 to 10 m2/s. Storativity can be ~10%. Yields at Hoggar vary from 15 to 63 l/s. The water table depth is typically 1 to 10 m.
Water quality is generally good, but the high aquifer permeability means groundwater is vulnerable to pollution. Some recharge is from direct rainfall infiltration. In Hoggar and Djanet, recharge occurs mainly during floods. Where the aquifers overlie karstic aquifers, recharge can occur by upward flow from these aquifers. Igneous aquifers exist in Zaccae, Djudjura, Collo and l'Edough in the east, and in Hoggar. Groundwater flows through fractures and altered horizons, and discharges naturally through springs. In Hoggar, borehole drilling has shown that groundwater is encountered at between 20 and 50 m depth. The aquifers generally have low productivity. Average total dissolved solids in Hoggar are 500 mg/l. Important recharge occurs in northern igneous aquifers. Cenozoic sandstones and limestones Semi-consolidated marine sedimentary rocks with relatively high porosity in which groundwater is stored and flows through both intergranular matrix and fractures. Northern (Atlas) domain: Jurassic and Cretaceous limestones Consolidated marine sedimentary rocks with relatively high karstic porosity, in which groundwater is stored and flows dominantly through fractures and karst conduits. This is often a highly productive aquifer. Yields of more than 100 l/s are seen from the Zibans karst; and greater than this from the Neritic formation of Constantine (900 l/s at Hamma springs; 400 l/s at Fourchi; 650 l/s at Boumerzoug). In some parts there is extensive groundwater discharge via springs, e.g. at Zaccar (Miliana sources), Djurdura, and its extension to Bejaia. Thermal waters. The groundwaters are generally of calcium bicarbonate or calcium sulphate type. Direct recharge, mostly occurring during periods of exceptionally heavy rain. Some recharge by horizontal flow from other aquifers. Southern (Saharan) domain: Complexe Terminal (Late Cretaceous to Cenozoic) and Continental Intercalaire (Palaeozoic to Late Cretaceous) These two aquifers together form part of the transboundary Northern Saharan Aquifer System (SASS), also known as the North-west Sahara Aquifer System (NWSAS) (see section on Transboundary aquifers, below). These are largely deeply buried, and can be at least 2000 m thick. Much of the aquifer is siliclastic sandstone; some parts are karstic; and there are some evaporates. This is often a highly productive aquifer. 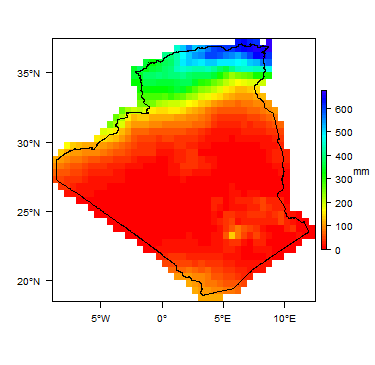 Analysis of pumping tests in the Continental Intercalaire in the Adrar region suggests hydraulic conductivity values of between 3 x 10-4 and 3 x 10-5 m/s. In some parts there is groundwater discharge via springs; in other areas there are no identified outflows, e.g. the Setifian in the south. The Continental Intercalaire has been exploited for centuries around its edges in the Sahara by foggaras (water galleries). The groundwater resource is generally considered to be 'fossil' - many thousands of years old - and in areas is known to be overexploited, with groundwater level decline (Moulla, 2012). Water quality ranges from good, with relatively low levels of mineralisation, to poor. In some areas, groundwater in the Complexe Terminal has salinity levels between 4 and 9 g/l (FAO, 2009). Groundwater from the Continental Intercalaire can be hot – between 45 and 65°C. Recharge is minimal, due to the generally deep burial of the aquifers and the arid climate. Small amounts of recharge occur from episodic rainfall where the aquifers crop out at the ground surface. Cambrian to Devonian sandstones Found in the south of Algeria in relatively small areas, in Hoggar and Tassili. They have high porosity. Exploited at Djanet by boreholes with an average depth of 400 m. Borehole yields are 20 to 30 l/s at Djanet, and 5 l/s at Tassilis. Key references for these aquifers are: ABH, 2009; Chabour, 2006; Djebbar, 2005; Ferraga, 1986; ISSAADI, 1981; Moulla et al., 2012; Schmidt, 2008; and Souag, 1985 (see Reference section, below). Weathering of basement rocks creates enhanced permeability and local aquifers of limited spatial extent, capable of supplying small yields from shallow wells. Recharge is small, occuring during episodic rainfall events. The potential for available exploitable groundwater has been estimated for 123 different hydrogeological units by the Agence Nationale des Ressources Hydrauliques (ANRH). The total available exploitable groundwater potential is estimated at about 2.7 billion m³ in the northern Atlas region and 5 billion m³ in the southern Saharan region. Some aquifers located downstream of dams are deprived of recharge. The ABH's Plan National de l'Eau, Mission 5, was aimed at increasing knowledge on water quality. Analyses of water quality focused on selected physico-chemical elements, including temperature, conductivity, chloride and sulphate, and on organic and mineral pollutants including nitrogen and phosphorous. The results showed that groundwaters are often hard, with high conductivity and high levels of mineralisation, in particular sulphate. The high conductivity, or salinity, is influenced in some places by aquifer lithology and mineralogy, but also by rainfall and high evaporation in arid and semi-arid zones, and in some cases by aquifer overexploitation. Some coastal aquifers have been intruded by sea water - such as the aquifer at Algiers; the alluvial aquifers of Bas Sebaou; and coastal aquifers in the Annaba-Bouteldja region. Salinisation of aquifers also occurs close to saline lakes, such as at Chott. Identified groundwater anthropogenic pollution occurs mainly in the coastal aquifers, which underlie highly urbanised areas, and where low levels of dissolved oxygen in groundwater are noted. Despite intensive farming, nitrate concentrations in groundwater generally remain below acceptable levels. Most permanent rivers are supported by groundwater in dry periods. There are groundwater-dependent wetlands in the region of El Tarf and Benazzouz. There are a number of different estimates of groundwater abstraction for different uses in Algeria. The volume of groundwater abstracted for agriculture and industry is reviewed annually, but there is considerable uncertainty, as data are scattered and often contradictory. One estimate of total groundwater abstraction from all sources across the country is 4.3 billion m³/year. In the northern Atlas region, the National Water Plan (Ministere des Ressources en Eau, 2010) estimated that 1.8 billion m³ groundwater is used annually in total. It is estimated that groundwater supplies 63% of total water demand in the Northern (Atlas) region, and 96% of water demand in the Southern (Sahara) region (FAO 2009). Irrigation is the largest user of groundwater. In 2012, 69 percent of the area equipped for irrigation was intended to be irrigated by groundwater. Of this, borehole irrigation comprised 41%, wells 26% and springs 2% (FAO AQUASTAT). Irrigated agriculture provides for 40% of national agricultural production (FAO 2009). The next largest user of groundwater is for domestic purposes. Most abstraction boreholes are fitted with an electric pump. The costs of drilling wells are highly variable. The average price for drilling a borehole is US$200/m (FAO 2009, from information from the National Agency of Hydraulic Resources). Drilling in aquifers with simple geology can begin at US$340/m, rising to US$380/m for drilling in more complex geology. Depth of boreholes also affects costs. Boreholes in deep aquifers in the southern (Sahara) region are often 200 to over 1000 m deep (FAO 2009). At a national level, the Ministry of Water Resources (MRE) is responsible for monitoring, coordination and preparation of legislation concerning the governance of groundwater. The Agence Nationale des Ressources Hydrauliques (ANRH) is responsible for the exploration and assessment and the protection of groundwater resources. The ANRH is also responsible for groundwater monitoring (see below). The Agence Nationale de Gestion Intégrée des Ressources en Eau (AGIRE) and the Agences des Bassins Hydrographiques (ABH) are responsible for overall water resources management. The ABH divides the country into five natural hydrographic units: Oranie-Chott Chergui; Cheliff-Zahrez; Algérois-Hodna-Soumam; Constantinois-Seybouse-Mellègue; and Sahara. These units are the focus for consultation and action on integrated water resources management. Algerian Waters (ADE) is responsible for the exploitation of groundwater for drinking water. The National Office for Irrigation and Drainage (ONID) is responsible for the exploitation of groundwater for irrigation. At the regional level, groundwater management organisations include the basin committees of the five divisions of the Agences des Bassins Hydrographiques(ABH); the advisory bodies established for consultation with representatives of the State; and local authorities and users. All of these interact to discuss and formulate opinions on matters related to water at the river-basin scale. At the local level, groundwater management organisations include the water resources directorates of the wilayas (departments), which are responsible in their jurisdictions for issuing drilling permits, accounting for abstracted groundwater flow rates, and monitoring and facilitating the activities of the water police. A recent major groundwater development initiative was the 2011 Réseau de Collecte project, to transfer from 50,000 - 100,000 m3/day of groundwater from the Ain-Salah Alba aquifer in the south of Algeria to the Saharan city of Tamanrasset, over 600 km away in the central south of Algeria (FAO AQUASTAT). The costs of abstracting water for agricultural use are below the real price of abstraction in all regions, ranging from 0.027 US$/m3 (FAO Draft synthesis report 2009) to 0.036 US$/m3 (OSS 2015). - disposal of any products and materials that could affect water quality. This legislation is implemented related to the identified protection perimeters. The Agence Nationale des Ressources Hydrauliques (ANRH) and Agences des Bassins Hydrographiques (ABH) are reponsible for groundwater quality and quantity monitoring at a national level, and for the collection, processing and updating of information on water resources. ANRH maintains a national piezometric network monitoring groundwater. This piezometric network is comprised of 500 observation points. Piezometric measurement campaigns and analysis are done in two annual campaigns (at low and high water-level points). The data are published in tables and maps, and stored in databases of various measured and observed data: 110 000 water point files (for boreholes, wells and springs) are inventoried and archived. ANRH also maintains a national monitoring network of groundwater quality with 550 monitoring points. These are sampled once per quarter for physico-chemical analysis, including conductivity and nitrogen elements, and twice a year for heavy metals. Water samples are sent for physico-chemical, bacteriological and hydrobiological analysis at one central or six regional laboratories, which have an annual capacity of 40,000 water samples (and 5000 soil samples). The analysed data are stored in a national water quality database, "SIQUEAU", which contains information from all water observation and measurement networks. The NWSAS/SASS is managed through a permanent tripartite consulation mechanism hosted by the Observatoire du Sahara et du Sahel (Sahara and Sahel Observatory) (OSS). The main objective is to coordinate the joint management of water resources in the NWSAS/SASS through the continuation of work to improve understanding of the system and its exploitation. This is done through a steering committee made up of the national structures in charge of water resources in each of the three countries, which act as the national focal points; a coordination unit is managed and hosted by the OSS; and an ad hoc scientific committee is brought together for evaluation and scientific orientation. - managing and updating the tools developed by the "NWSAS" project, including the NWSAS model - establishing and maintaining observation networks - analysing and validating data concerning the resource - developing databases on the socio-economic uses of water - identifying and publishing indicators concerning the resource and its uses - promoting and performing studies and research conducted in partnership, and - developing and implementing training and improvement programmes. Many of the references below, and others related to the hydrogeology of Algeria, can be accessed through the Africa Groundwater Literature Archive. Agence du Service Géologique de l'Algérie. 187 cartes à l’échelle 1:50 000 et 165 notices explicatives; 13 cartes à l’échelle 1:100 000 et 4 notices explicatives; 24 cartes à l’échelle 1:200 000 et 9 notices explicatives et 8 coupures spéciales. Actualisation et finalisation de la carte géologique de l'Algérie au 1:2 000 000 avec l'appui de l'imagerie ALSAT1. Société Nationale d’Editions et de Diffusion (SNED).‎1978. Carte géologique du nord-ouest de l'Afrique, 1:5 000 000. ‎Mémoires de la Société d'histoire naturelle de l'Afrique du Nord, Alger. Bertrand, J-M, et Caby, B. 1977. Carte géologique du Hoggar, 1:1 000 000. - Alger. Service géologique de l'Algérie/Société nationale de recherches et d'exploitation minières. 1 carte en 2 coupures : en coul. BRGM, 1962. Carte géologique du Sahara : massif du Hoggar, 1:500 000. Paris. 1 carte en 12 coupures : en coul. et notice. Vila, J M, et al. 1978. Structural map of the Alpine chain of eastern Algeria at 1:500 000. Arris, Y. 1994. Etude tectonique et microtectonique des séries Jurassiques à Plio-Quaternaires du Constantinois central (Algérie nord orientale) caractérisation des différentes phases de déformations. Doctorat d'université, Nancy I, 215p. Askri, H, Belmecheri, B, Benrabah, B, Boudjema, A, Boumendjel, K, Daoudi, M, Drid, M, Ghalem, T, Docca, A M, Ghandriche, H, Chomari, A, Guellati, N, Khennous, M, Lounici, R, Naili, H, Takherist, D, et Terkmani, M. 1995. Geologie de l'Algerie /Geology of Algeria. Contribution from SONATRACH Exploration Division, Research and Development Centre and Petroleum Engineering and Development Division. Schlumberger WEC SONATRACH. Coiffait, P E. 1992. Un bassin post-nappe dans son cadre structural l'exemple du bassin de Constantine (Algérie Nord Orientale). Thèse Sciences. Nancy I.P.502. Donzeau, M. 1972. Les déformations hercyniennes dans le paléozoïque des monts d’Ougarta (Sahara occidental algérien). C.R. Acad. Sci., Paris, t.274, 3519–3522. Echikh, K. 1975. Géologie des provinces pétrolières de l'Algérie, SNED, 173p, Alger. Kazi Tani, N. 1986. Geodynamic evolution of the North African border: intraplate North Algerian area mégaséquentielle approach, 3rd cycle Thesis, Univ. Pau, 870 pp. Shluter, 2008. Geological Overview of Algeria. Vila, J M. 1980. The Alpine range of eastern Algeria and the Algerian-Tunisian border, Thesis Univ. P. and M. Curie, Paris. Wildi, W. 1983. La chaine tello-rifaine/The Tello-Rif range (Algeria, Morocco and Tunisia). Revue de géographie physique et de géologie dynamique, Vol. 24, Fascicule 3, 201-297, Paris. ANAT. 2003. Atlas Thématique ANAT. Agence Nationale des Ressources Hydrauliques (ANRH). 1988. Hydrogeological map of Bechar (1:500 000). UNDP Project: Water resource study of Algeria (Alg 88/021). Agence Nationale des Ressources Hydrauliques (ANRH). 1992. Hydrogeological map of the Hoggar and Tassilis (1:1 000 000). UNDP project ALG/021: Water resources study of Algeria. Agence Nationale des Ressources Hydrauliques (ANRH). 2003. Carte des aquifères de l'Algérie. Map, 1:4.5 million, from Water resources Map of Maghreb, Sirepan Water Resources Information System of Northern African Countries, African Organization of Cartography and Remote Sensing, Algiers. ANRH / Energoprojekt. 2009. Hydrogeological Map for North Algeria, 1:3 000 000. ANRH / Energoprojekt. 2009. 41 Cartes Hydrogeological/maps for North Algeria at scale of 1:200 000. BRGM. 2008. Carte hydrogéologique de l'Afrique à l'échelle du 1/10 Million. Hydrogeological map of Africa, France, 2008. Achi K. 1970. Hydrogéologie du bassin du chott d’El Hodna - Essai de synthèse des connaissances actuelles. Agence de Bassin hydrographique (ABH). 2009. Qualité des eaux souterraines dans les bassins du Kebir-Rhumel, de la seybouse et de la Medjarda-Mellegue, 2004-2007. Les Cahiers de l’Agence. p13. BCEOM - BG - SOGREAH group/ Ministry of Water Resources Department and Hydraulic Facilities (DEAH). Mission 2 - A. Report: Actualization and completion Study of National Water Plan. Hydrographic Centre and East regions. Bellaidi, M, et Rebheoui, H. 2002. Note sur l’évolution de la nappe de la Mitidja - Document ANRH N 038. Besbes A et Mehdid A. 1980. Modèle de simulation hydrogéologique du bassin du HODNA. Bousnoubra H. 1985. Hydrogéologie de quelques réservoirs karstiques du Nord-Est algérien - Synthèse des connaissances actuelles - Mémoire de thèse de 3ème cycle, Université des Sciences et Techniques du Languedoc, Montpellier. Castany G. 1981. Hydrogeology of deep aquifers: the hydrogeologic basin as the basis of groundwater management. Episodes, Vol. 3, 18-22. Chabour N. 2006. Hydrogéologie des domaines de transition entre l’Atlas saharien et la plateforme saharienne à l’Est de l’Algérie. Thèse de Doctorat. Université de Constantine. Chemin J. 1975. Etude hydrogéologique de la plaine OUED KEBIR et du massif dunaire de GUERBES – Document ANRH N 75. Conseil National Economique et Social (CNES)/Commission de l’Aménagement du Territoire et de Environnement. Avant-projet de rapport ' L’eau en Algérie : le grand défi de demain'. Derekoy A. 1973. Etude hydrogéologique dans le bassin du chott EL HODNA - Document FAO – M.A.R.A. Derekoy A et Guiraud R. Carte hydrogéologique de synthèse, région du HODNA - Document Ministère des Ressources en Eau. Deutsche Gesellschaft für Technische Zusammenarbeit (GTZ). 1988. Rapport bimensuel de suivi de Projet PANE, Algérie, N°1. Dib H. 1985. Le thermalisme de l’Est Algérien - Mémoire de thèse de 3ème cycle, IST-UTHB. Djidel M, Bousnoubra-Kherici H and Nezli IE. 2010. The Minerality Impact of Deep Groundwater, in Desert Regions, on Human and the Environment. Southeast Algeria. European Journal of Scientific Research, 45(4), 540-551. Djebbar M. 2005. Caractérisation du système karstique hydrothermal Constantine-Hamma Bouziane -Salah Bey dans le Constantinois central (Algérie nord orientale) Thèse de Doctorat. Durozoy G. 1952. Les massifs calcaires crétacés de monts de Constantine - Etude préliminaire. FAO. 2009. Groundwater Management in Algeria Draft Synthesis Report. Rome: Food and Agriculture Organization of the United Nations. Ferraga A. 1985. Ressources en eau des karst du nord algérien - Mémoire de thèse de Docteur-Ingénieur, Université des Sciences et Techniques du Languedoc, Montpellier. Ferraga A. 1986. Ressources en eau des karsts du Nord Est Algérien- thèse pour obtenir le grade de docteur-Ingénieur. 166 pp. Gueorguier. 1974. Géologie, hydrogéologie et essai de synthèse des massifs calcaires du flanc Nord de l’AURES. ISSAADI A. 1981. Etude hydrogéologique des massifs du Guerioun et Fortass (dans le Sud constantinois). Thèse de Doctorat troisième cycle. IST. USTHB. Alger. Kardache R. 1988. Ressources en eau des karsts du Sud Est Algérien - Mémoire de thèse de Docteur-Ingénieur, Université des Sciences et Techniques du Languedoc, Montpellier. Khérici N, Bousnoubra H, Derradji EF and Maoui A. 2009. Mobilization and management of the water resources in the north-east of Algeria. Geographia Technica, 8(1). Moulla A, Guendouz A, Cherchali M-H, Chaid Z, and Ouarezki S. 2012. Updated geochemical and isotopic data from the Continental Intercalaire aquifer in the Great Occidental Erg sub-basin (south-western Algeria). Quaternary International, Vol. 257, 64-73. OSS (Sahara and Sahel Observatory). 2003. Etude du système aquifère du Sahara septentrional, projet SASS. Petit V. 1987. Etude par modélisation mathématique de la plaine d’Annaba –Bouteldja. Plan National de l’eau (PNE). 2005. Etude d’actualisation et de finalisation du plan national de l’eau (PNE) - Régions hydrographiques Centre et Est. Rapport de mission 2 – Volet 4 – Hydrologie, entreprise par BCEOM-BG-SOGREAH/MRE. Ricard J. 1974. Etude relations, transmissivités et résistances transversales, système aquifère de TEBESSAMORSOTT - Implantation de forages - Document ANRH N 74/39 bis. Ross AR. 2015. Algeria: fracking and the Ain Salah uprising. The Ecologist 14th March 2015. Schoeller H. 1943. Etude hydrogéologique de la plaine de AIN M'LILA et de ses environs. Water in Algerian Sahara: Environmental and Health impact]. In Advancing Desalination. InTech. Souag M. 1985. Etude hydrogéologique hydrochimique et isotopique de la nappe néritique septentrionale de Constantine N-E Algérien. Thèse doctorat Univ de Paris Sud France, pp. 135–141. This page was last modified on 18 February 2019, at 11:08.